Notwithstanding the fact it was President Obama who ordered the modernization of the U.S. nuclear arsenal at a cost of $1 trillion, Trump’s remarks take on an ominous shade given that they come less than a day after he threatened North Korea with “fire and fury” if it threatened the U.S. Those remarks were in apparent response to a Defense Intelligence Agency assessment that North Korea now possessed a miniaturized nuclear warhead that could be fitted onto an intercontinental ballistic missile (ICBM) capable of reaching the United States. North Korea, staying true to its own bellicose rhetoric, said it was considering using intermediate-range ballistic missiles near Guam, the U.S. territory in the Pacific; all of this escalation came days after the UN Security Council voted unanimously to tighten international sanctions of North Korea for testing two ICBMs last month. It’s not the first time Tillerson has tried to serve as Trump’s interpreter. The secretary of state has massaged the president’s message on nearly every single foreign-policy challenge faced by Trump’s young administration. When Trump described NATO, the bedrock of Western security after World War II, as obsolete, and suggested that U.S. military support for its partners in alliance was conditional upon their military spending, Tillerson tried to assuage the concerns this raised among NATO partners—and reportedly received an ovation from them. I think, with respect to how we conduct foreign policy in the—in light of the fact that the President communicates the way he does, as I explained to the people in this building, look, it’s just like anything else. It’s part of the environment in which we work. We’ll adapt to it. We’ll adapt to it. There’s a lot of unexpected things that happen to us in the world of diplomacy and we know how to adapt to that, we know to work with it, and so I don’t view it as an obstacle, a hindrance, or as an assistance. Whatever the President chooses to express, he expresses, and then that’s information to everybody, us included. Then there is North Korea—an issue on which the Trump administration has sentmixed messages since taking office in January. 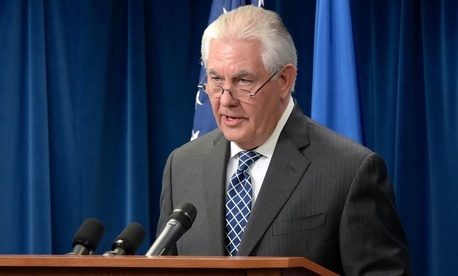 Tillerson said the Obama-era policy of “strategic patience”—the attempt to isolate North Korea without offering it any inducements to change its behavior—was over. Trump himself vacillated over the role he thought China, the main power broker in North Korea, could play to help resolve the issue, initially saying China wasn’t doing enough, then saying it was, and then going back to denouncing China’s failure to rein in its client; his secretary of state said China does have a role in resolving the issue. The president, who at one point described Kim as a “smart cookie,” also appeared to draw a “red line” on North Korea’s ability to threaten the U.S. with a nuclear-armed ICBM after Kim oversaw two missile tests last month. Tillerson said the U.S. was open to talks with the North if it stops its missile tests. The North has rejected that offer, citing U.S. rhetoric. Which brings us to Wednesday’s statements by Tillerson and the accompanying tweets by the president. The secretary of state might assure the U.S. public that he has the issue covered and that they can indeed “sleep well at night,” but it’s Trump’s words that are being heard in Pyongyang and the rest of the world. North Korea’s public statements say its nuclear and missile tests are a response to its fears of a U.S. invasion. If the American president is making statements that seem to threaten exactly that, what good is Tillerson’s gentle suggestion to stop testing?